Politicians are routinely hypocritical in support of partisan ends. When their party's nominee for the U.S. Supreme Court is facing confirmation, they insist that every candidate should receive a fair hearing and an up or down vote. When an opposing party's nominee is in the same shoes, they claim to be proud to play hardball to keep that person off the bench. When their partisans are accused of personal misconduct, they downplay or deny that there was wrongdoing, while they push for harsh accountability when their opponents are accused. When the other party runs up huge deficits they decry that party's gross irresponsibility, and then run up huge deficits themselves without a peep of complaint about their own party's actions. When the other party secures a diplomatic agreement they complain about being too soft on the nation's adversaries, and then when they are in power coo over the positive aspects of the nation's adversaries, presumably in the interests of diplomacy. Politicians who decry government regulation when another party is in power often actively support a great deal of government regulation when they are power. The rare politicians who take long term positions on a bipartisan basis, while hailed as statesmen by some observers are frequently decried as traitors by their fellow partisans. Politicians do not behave this way, because voters don't care, not by mistake, or because their hypocrisy is unlikely to be observed. While an occasional politician may indeed be dumb, as an occupational class, overall and on average, they aren't stupid. Politicians act this way, in part, because they know that they won't pay a political price with voters for taking inconsistent positions or acting hypocritically in pursuit of partisan advantage. And, this isn't because their hypocritical conduct is unlikely to be discovered. The portion of the voting public that is paying attention is routinely made aware of hypocrisy on the part of politicians when in occurs in news reporting, in published opinion pieces, on social media, in discussions with other people about politics, and in attack ads when election season rolls around. It seems to follow logically, that politicians aren't concerned about acting hypocritically because voters and other people whose support they need don't really care about this conduct. Whatever causes this behavior, moreover, has to be pretty fundamental, because this conclusion holds true robustly. While I drew my examples of hypocrisy above mostly from U.S. politics, the observation that politicians aren't worried about hypocrisy and taking inconsistent political positions over time, seems to be fairly universal. The same conduct is routinely seen in every other country with democratic elections of which I am aware. Even politicians in totalitarian regimes act this way, leading to sudden about faces on what is good and bad in regimes like China that sound like they come right out of George Orwell's "1984", and while totalitarian politicians don't have to campaign in democratic election, they too should care somewhat what people think about their actions, because still need public support to be legitimate and need support from leadership group elites. Median voters tend to have fairly stable interests. For example, the extent to which U.S. counties are liberal v. conservative in their electoral behavior in the U.S. on relative basis has been largely unchanged for at least a century and a half. For example, rural Indiana and Arkansas have leaned conservative, while New England and major U.S. cities have leaned liberal since before the mid-19th century, even as the liberal and conservative political parties in the U.S. have flipped. The median voter theorem, which has considerable empirical support, argues that politicians pursue policies that favor the median voter. So, it would naively seem that voters should favor politicians who can make credible long term commitments to policies and political norms that advance their interests, over those who demonstrate hypocrisy who will betray their constituents from time to time. And, as I noted above, information about hypocrisy by politicians is one of the more widely disseminated kinds of information about politicians in our political system and most democratic systems. So, if any information about the conduct of politicians is available and influences voter conduct, information about hypocrisy on the part of politicians should be a powerful force influencing voter behavior. But, empirically, it also seems clear that voters don't care in a way that influences how they vote. There is no evidence that politicians who act or in a hypocritical manner have a harder time getting re-elected. If anything, the reverse is true. More generally, it seems that the public isn't very concerned about hypocrisy by politicians when their concerns are evaluated on the basis of their revealed preferences (i.e. by what they do rather than by what they say), even though many people in the abstract would say that politicians shouldn't be hypocritical. My question is, why do voters not care when politicians are hypocritical in support of partisan ends? Is there any political theory literature that explains this phenomena? Short answer: everybody hates somebody, and by extension that person/group's cherished pet cause. Person A: Hey there gun owner, did you know that you support school vouchers? Person B: I do? Why? Person A: Because the people trying to take your guns away hate them. Person A: Hey there pro-choice person, did you know you hate school vouchers? Person A: Because right-to-lifers love them. This dialog rarely if ever is spoken aloud, but occurs internally as part of some calculus of politics. And of course, once sides are taken, politics is the mind killer: arguments (and scandals) are soldiers, any concession means aiding the enemy. Hence "hypocrisy". Note that the above narratives are perfectly comprehensible (from a US perspective) regardless of how you feel about any of the issues mentioned. This also explains the otherwise hard-to-explain juxtaposition of certain elements of party platforms like attitudes about economic liberty vs. social liberty. Indeed, a common trope of both history and fiction is that when one is involved in a sufficiently intense conflict, one is faced with the quandry of sacrificing principles in pursuit of one's goals or staying the true path possibly at the cost of victory. Even median voters have hot button issues, and while party platforms enforce a certain amount of adherence any given candidate will be hotter or colder on the radar of any given voter. So the median voter may very will flit back and forth between parties, but the x issue for their particular value of x is the driving force. People do react negatively to hypocrisy, at least in laboratory experiments in which they have to punish hypothetical criminals (Laurent, 2012); they punish the hypocrites more. But this is largely a form of "cold" thinking. In politics however, there are substantial counter-effects to this, like myside bias. There are some neuroimaging studies, e.g. Westen (2006) on partisan (aka "motivated") reasoning, showing that it differs at brain-activation level from "cold" thinking. And this kind of partisan (myside) bias turned out to be equally distributed on the political spectrum in the US, according to a recent meta-analysis (Ditto, 2018). found support for the idea that political hypocrisy is evaluated much more negatively than scandals that play into existing stereotypes about politicians pursuing their own ideological interests. A Social Democrat is punished more for using private hospitals than a Liberal, because their party position is to be sceptical towards private hospitals. Similarly, it is considered more damaging when a Liberal cannot control their own private economy, as personal fiscal responsibility is a central part of their party agenda. These results indicate that even scandals belonging to the private sphere of a politician’s personal life are evaluated on political grounds by voters. 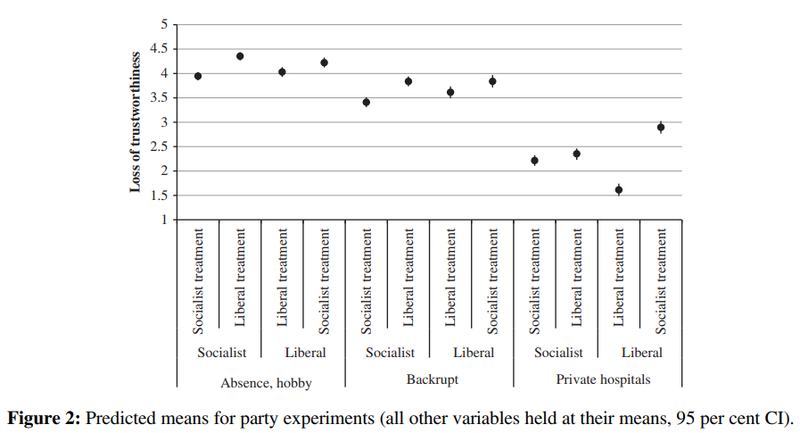 left-wing voters evaluate private life scandals more mildly for left-wing politicians than right-wing voters do, whereas they evaluate right-wing politicians more harshly than right-wing voters do – and vice versa. Figure 2 illustrates this effect. First and the third estimates from the right (same-party evaluation) are always lower than every second and fourth (other-party evaluation). For the private hospitals, the difference across treatment status is much greater for liberals than socialists. This is because socialist respondents punish socialist politicians for hypocrisy while evaluating them favourably for being sameparty candidates, and these two tendencies almost cancel each other out. Interestingly, the interaction effect is largest for the private hospital scenario, the scenario with the clearest political-ideological hypocrisy. This could indicate that voters become more partisan in the scenarios where the political cues are most pronounced. why don't voters care when politicians are hypocritical in support of partisan ends? I will limit my answer to one argument. It's not the only argument, but I think it's a good one. My answer is: lack of alternatives given a voter's preference. I start with a general comparison of two-party versus multi-party systems. Then I give an example of how people do care about actions and how that affects the polls. In a two-party system, many people lean towards one of the parties. In multi-party systems, the same may hold for a larger subset of parties. For example, there could be multiple progressive parties like En Marche and MoDem in France. In that case, a liberal leaning voter may lean towards both and away from the others. In a two-party system a person leaning towards one party is unlikely to vote for the other. Their preferred party would have to do relatively (depending on how strong the voter feels) bad things to have the voter opt for the other party. If there are multiple parties in the voter's sphere of preference then it's easier for the voter to opt for another party. A good example of that can be found in the Netherlands, with two large progressive parties Democrats 66 (D66) and Green Left (GL). The first is part of the national government coalition and the second isn't. On a local level, they are said to target the same type of voter. "Regeren kost tegenwoordig steun van de kiezer. Niet alleen in Nederland, je ziet dat breed internationaal. Dat geldt met name voor de kleinere partijen binnen een coalitie, de zogenoemde junior partners. Niet voor niets verliezen ook CDA en D66 in de Peilingwijzer zetels, nog meer dan de VVD. Alleen de ChristenUnie, een partij met een relatief trouwe achterban, boekt een heel klein plusje." In essence, he is saying that parties in government generally lose votes and that this phenomenon is not limited to the Netherlands, but that it is also observed internationally. He does note that one of the smaller christian parties in government does rise in the polls, which he explains by saying they have a loyal following. My question is, why don't voters care when politicians are hypocritical in support of partisan ends? Power. Simply put, if an individual isn't towing the party line, but winning and getting results: then the ends justify the means. The best example, is Trump. Trump does not exemplify the best Christian values, he does however, make choices and take stances that Christians support. This is extremely rational. Because it's a recognition that the game is a little dirty. It's really not about values, principles, ethics or doing what's right. It's about winning and then doing what's "right". To be clear here, I didn't pick Trump because he's exceptional in this regard, he is not. He's maybe more honest about how things are brokered in politics. Which, has the side effect of likely creating partisanship. But in reality, he's approaching it rationally. It doesn't matter if he's inconsistent or hypocritical, as long as he leaves lasting changes that support Conservative values. This is in essence the goal. To essentially win, stack government with people who support your policies and value positions. Gerrymandering is another great example of this sort of mindset of winning to stack the deck in the future. Proportionally, it takes fewer votes to get more Republicans. 241 seats and 63 million votes translates to 261k votes per seat for the GOP. 191 seats and 61 million votes translates to 318k votes per seat for the Dems. The idea is that winning is more important than actual values or ideas. It simply comes down to: Win, stack, win more. So that eventually, you can just steamroll opposition. Voters forgive the hypocrisy because winning is more important than being fair, balanced or creating compromise. If you're a Christian, and you oppose abortion and you want to stop the killing of innocents. (Remember, there is no right or wrong here, this is how the voter sees it) Then you might see Trump as a compromise. Yes. Trump is brash and not quite Christian, but he's putting in place the people who will put in the polices that these particular Christians want. From a potential Christian point of view, this is rational. Trump breaks some rules, but we might long term, save innocent lives, and that's worth breaking some rules. ...and this is often something that most people don't outwardly say. But it's the basic truth. If someone who isn't ideal, wins and then implements policies and hires people who follow through, then it's irrelevant how they got to where they are. .. and this is sort of the muddy water we're in. People are complex and often we try to define them by a singular action, but by doing that we ignore the rest. In politics, I'm saying... that's not always the case. There is a constituency of voters who likely believe their candidate "[example bad behavior] but he saves." and a vote isn't a "kinda" thing, you either cast your vote or you don't. ...and a vote from someone uncertain is the same as someone who is all in. There's no degrees... and in essence many voters have to make absolute choices and essentially have to weigh the "big picture" of their positions. Is Trump ideal? No. Is abortion ideal for a Christian? No. What's more important? Trump being good, or the stopping of abortions? Stopping abortions. Does Trump want to stop abortions? Yes. Then Trump is the mechanism that will create that policy. Personal note, I do this all the time too. This isn't just lobbing pop shots at Trump because he's in the media, but I'm pointing out that in the end, it's not just a question about hypocrisy. There's far more important things at play than just a politician's character. Sometimes there's serious value questions for voters that they feel an imperfect agent of change is better than no change. [UPDATE] Fixed some grammar and spelling. Since it got a few upvotes. People simply want to win, regardless of the size of the prize. People who make $35k in a office where the average is $30k are happier than those making $40k in an office where the average is $45k. Voting is not a logical behavior, it's an emotional one. It's silly to try to imagine someone tallying up some score card in the fall and picking a party, yet we often pretend that some egregious act will be a "disqualifier" once such a calculus is made. This moves political beliefs more into the realm of religious beliefs. Nobody faults god for murdering villagers while commanding "thou shalt not kill"; he's god, and who's side are you on, anyway? As long as "the good side" wins, (almost) nobody who cares will care how. Partisanship seems very black and white, but the specific way you asked your question isn't that simple. People on the left tend to vote left and people on the right tend to vote right - that's not news. Elections are decided not so much by which side has more people, the left or the right, but by which side is less motivated and more likely to stay home and elections are also decided by the centrists. People with no loyalty to either party (or, one could say, disgust for both). Partisanship can play a role in a few ways. "Look how partisan my opponant is, he voted for this, this and that, right in line with (Obama/Trump). My opponent is a partisan liberal/conservative, that's why you must vote for me. If a candidate is truly and grossly partisan, I think that can motivate the other side to be more likely to get out and vote against him. Overly partisan candidates don't seem to have a lot of staying power. Ted Cruz (who may lose), Dennis Kucinich (distracted out by his own party), Michelle Bachmann (was expected to lose, opted not to re-run). I don't consider Obama overly partisan but he was painted that way and while he never lost an election, his party a whole lot during his watch and the same situation appears to be underway under Trump. Partisanship is often punished by the other side getting out and voting in larger numbers. Also, Partisanship can be punished by the centrists. The people with no strong allegiance to either party, and, I'm the first to admit that I don't understand non party affiliated people well, but I've known a few. They do exist and in large enough numbers to matter. I'm not talking libertarians who vote republican or green party liberals who vote democrat, but actual centrists who could vote either way. I can't provide solid numbers on this, but I believe that they would vote against over the top partisanship. So to the voters, partisanship doesn't matter. Where it might not matter is for the voter who always votes left or always votes right - they usually won't abandon their beliefs just because their guy is over-the-top partisan, but to other voters it does matter and it can hurt a guy get re-elected. Now, politicians, once in office have their constituency, so they may have reasons to be partisan, for better or worse, but if they go overboard, the voters might turn on them. Ted Cruz for example was a strong candidate for the Republican presidential nominee and might well have beaten Trump head to head in 2016 and in 2018 he might lose his senate seat. Where I agree with the asker of this question is that there's too much partisanship in politics and both sides have their loyal voters who won't waiver pretty much no matter what. Where I disagree, is that partisanship actually can hurt a candidate (examples above) because enough voters will notice and vote accordingly. What you call "partisanship" goes by a different name within a party. Maybe it's "values", or maybe "the most important thing", or "what we're trying to accomplish", or things like "progress", "growth", and "prosperity". Since politics is a matter of power rather than truth, politicians need to do whatever is necessary to apply power toward "the most important thing". An example would be the idea that conservative politicians favor less government spending: I don't believe that any Republican today would deny this. Why, then, has government spending not been reduced more-than-it-has through Republican control of the Federal government? The only possible answer is that the politicians are confident that their voters will forgive them for doing less on the budget as long as they accomplish something that's more important. One thing about hypocrisy is that it is an accusation that the politician must face: he (or she) is the one who made the claims, and we can all see that those claims are fake. It doesn't cause confusion on our part but for a moment; other kinds of lying are more damaging, I suppose. It is becoming clearer every day that divisions between these two groups are becoming larger and irreconcilable, almost like those two groups want to live in separate states. It is not uncommon these days that people from one group do not know personally anyone from other group . Of course, both sides seek some political party or movement to represent their interest. In this case first group is more and more identified with GOP (especially conservative Republicans) and second with Democrats (especially left-leaning Democrats) . With ideological differences growing, those in the middle (independents, so called moderate Republicans and Democrats) are losing ground. Any sort of compromise is sen by both sides as weakness. In such situation, bi-partisanship is slowly dying and people tend to root for their side. It is almost like in war - even if our side makes some dirty trick, it is excused because it harms enemy. Any personal flaws of politicians, or even direct breaking of law is viewed trough partisan glasses, and if said politician is good party solider, his side would forgive him his transgressions. In such state, law is getting sidelined anyway, because it is fruit of political compromise, and as mentioned before, compromise is more and more a dirty word. This is an opinion, but I feel as if a lot of people root for party because they view it like a sporting match. They have their team that they have chosen and they want them to beat the other guys. It sounds stupid, but at this point I think it's more about not letting the other side win than it is about being a good team that one can be proud of. My question is, why don't voters care when politicians are hypocritical in support of partisan ends? Is there any political theory literature that explains this phenomena? The question starts with an assumption that voters don't care, which is not necessarily the case. Perception of political hypocrisy can be deemed to be related to the feeling of cynicism that seems to affect modern Western societies. I might have a bit more to say, but @Fizz already said it better in their answer discussing Bhatti et al 2013. Prete, M. Irene, et al. "Political disengagement and political hypocrisy: A hidden connection?." Proceedings of the Academy of Marketing Conference-The Magic in Marketing. 2015. People are essentially forgiving towards 'their tribe' in most cases, will assume that they are doing the right thing, so the means justify the end. Plus, politicians, even in one's party, are expected to be somewhat economical with the truth so a certain amount of cognitive dissonance is tolerated. On the other hand, they will scrutinize other groups for their motives more. Rather than taking electoral politics straight on as an example, let's look at international relations, such as trade negotiations, between peer countries. People who've lived long times in different countries might be familiar with this phenomenon. Canada for example will have an internal narrative why its position is justified on dairy products. While the US will do the same. Neither side is wholly without merit and neither side is entirely right. But people on both sides of the border will see things mostly from their country's side, not necessarily out of hypocrisy, but just because they just only know their side. Since the issues at hand are complex and rarely black and white, and are separated in time (the Supreme Court nominations have years between them), there is a large leeway for politicians to frame the message as they best see to their immediate advantage, without great risk of being called out. The more strongly people are affiliated with one party or another, the less the issues will be evaluated against the opposing side's, which mirrors what happens when they are international issues between different countries. A less divided electorate might be more inclined to question their party's position, if it is sufficiently at odds with previous ones. The current style of partisanship is less respectful of others, and its own limitations. It praises itself, it's greedier and wants the world. Partisan voters avoid criticism of their side like it was the plague, but relish critiques of, and scandals involving, their opposition. Therefore partisans often don't even know if their side is hypocritical, because they never hear about it. Similarly, partisans often don't know about the good things their opponents do, and therefore think the worse of them, which in extreme cases leads to, (or reinforces), paranoia. 2018 journalism makes this avoidance easy to do. 2018 technology also makes avoidance easier. Media bandwidth has increased, media channels have increased. 2018 labor practices (more hours) and sprawl (longer commutes) reduce public leisure, people have less time to hear from other sides. The per capita bandwidth of public attention has decreased. As our attentional bandwidth shrinks, content providers compensate by simplifying things. Increasing household debt. Debt doesn't just reduce leisure, (because more work must be done to pay it), it flavors the remaining leisure with stress and worry. Worried people tend to be partisans for whatever or whoever promises to relieve their immediate burdens. Reagan-era FCC deregulation helped make current journalism possible. It allowed fewer people to own more TV and Radio stations -- even now still the largest generally available national mediums. It killed the "equal time" rule, which helped do a little more of what 2018 journalism generally fails to do. Not the answer you're looking for? Browse other questions tagged election political-theory parties or ask your own question. King secretly funds left and right wing parties to stay in power. What's this called? If judges are appointed, why should law makers be elected? Why should I care about federal vs state rights? Why are Democrats and mainstream media more tolerant about undocumented migrants?